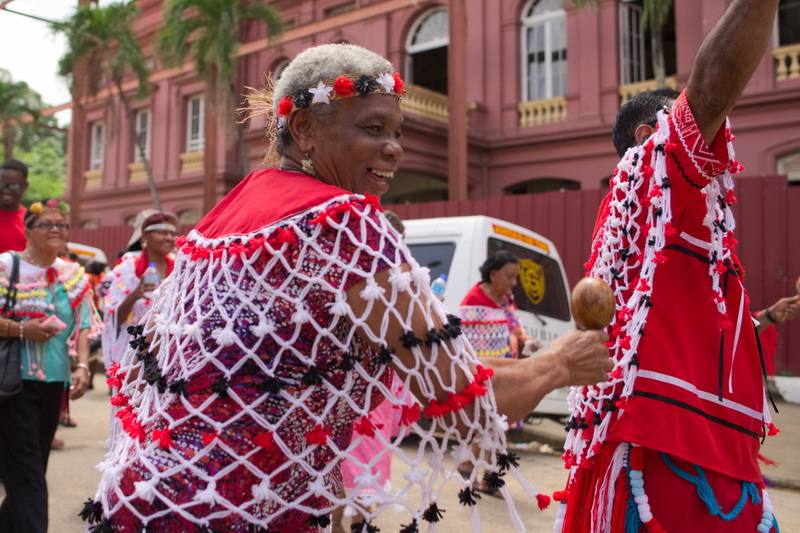 Trinidad, once called ‘Kairi’ (or possibly ‘Iere’) was aboriginally inhabited by many groups of Amerindian peoples who populated the Caribbean and South American region. Among these peoples were the ‘Lokono’ (also sometimes called ‘Taíno’); the ‘Nepoyo’ (or ‘Nepoio’); the ‘Yao’; the ‘Shebao’; and the ‘Carinepagoto’ among others. There were maybe also ‘Kalifuna’ (possibly related to the ‘Garifuna‘ of Saint Vincent and the ‘Kalina’ of South America). 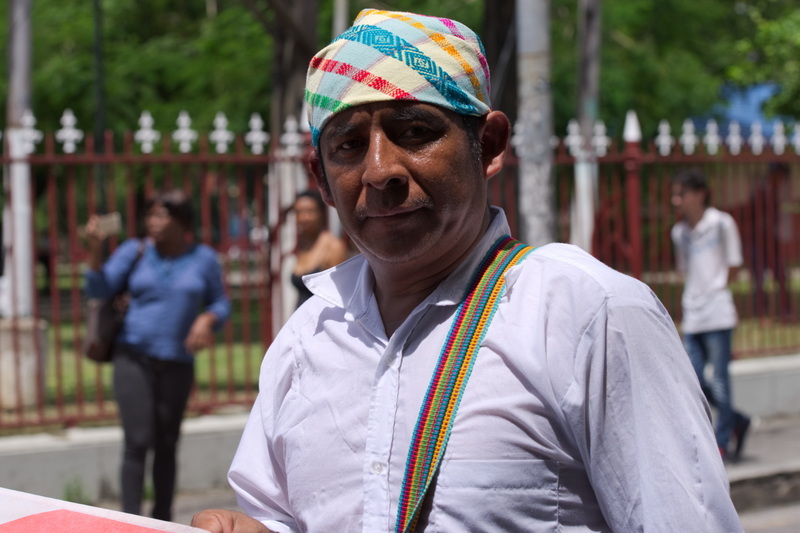 In South Trinidad, there was the ‘Warao’ who also inhabited parts of Venezuela. The population of Kairi at the time was believed to be at least 40,000. In 1498, over five-hundred years before this writing, the island was spotted by Italian coloniser, Christopher Columbus, sailing his third voyage to the West on behalf of Spain (it is uncertain if Columbus himself actually set foot upon Kairi). Following his reconnaissance, between 1510-1595 the islands were conquered by Spanish invaders. 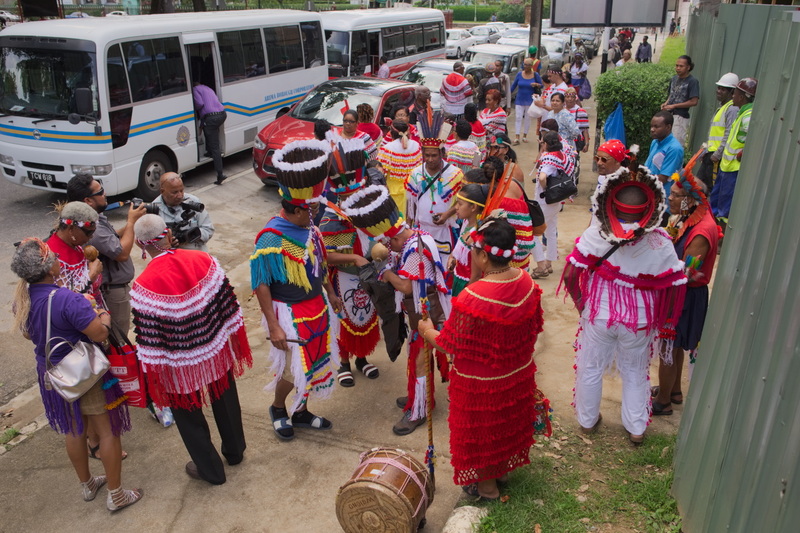 Maxis of various first peoples groups arrive at Woodford Square, Port of Spain. 12th October, 2017. 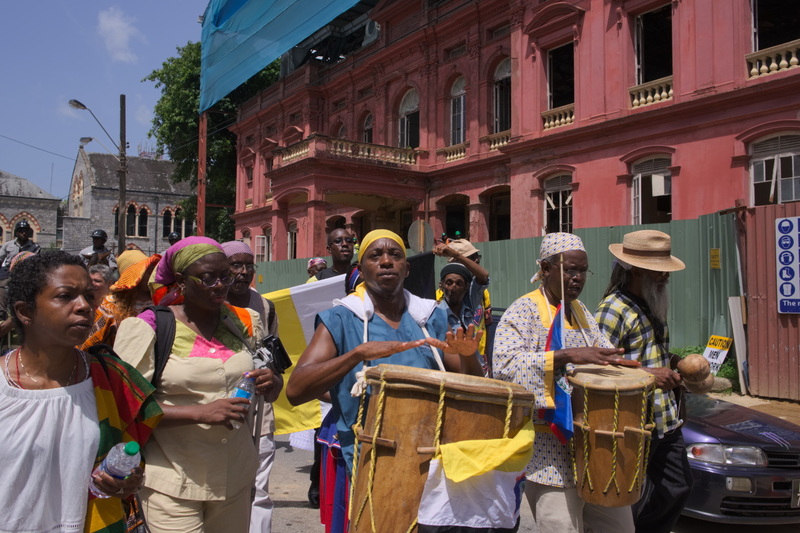 Various first peoples across Trinidad, the Caribbean region, and as far as Canada, gather outside the Red House, Abercromby Street, Port of Spain. 12th October, 2017. Mariah Smith Chabot of a Canadian delegation of first peoples. 12th October, 2017. 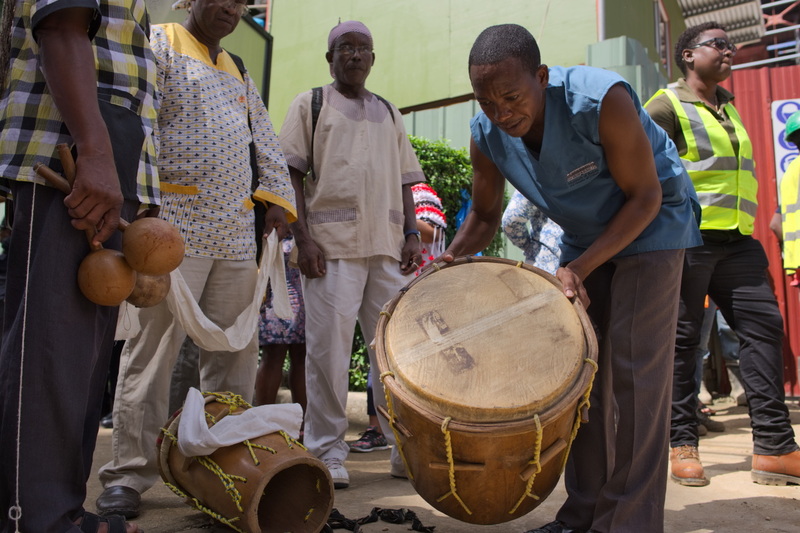 A Garifuna drummer sets up instruments. 12th October, 2017. 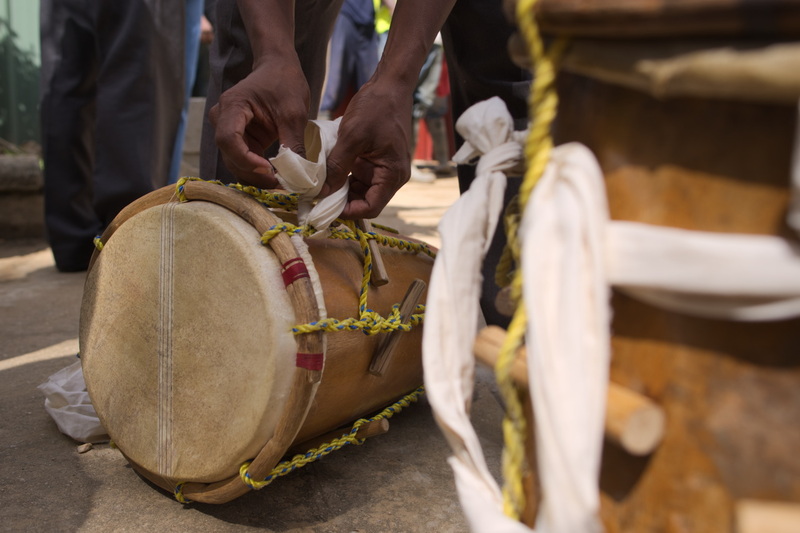 Garifuna drums. 12th October, 2017. A pair of Garifuna drummers from Belize ready themselves and their instruments for the coming day's activities. 12th October, 2017. Water is poured from a plastic water bottle into a half-gourd while tobacco is smoked. The tobacco smoke will be used as part of the Amerindian ritual. 12th October, 2017. 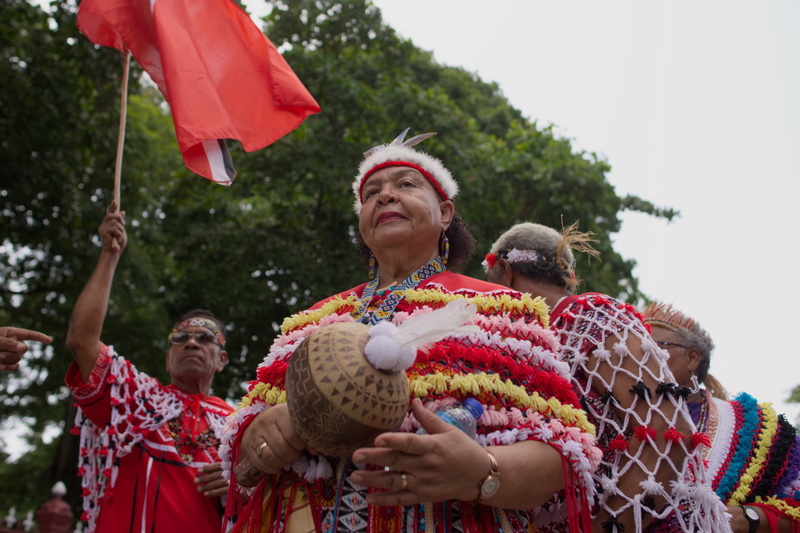 Various symbolic elements are brought together in order to begin an Amerindian ceremony outside the Red House. 12th October, 2017. 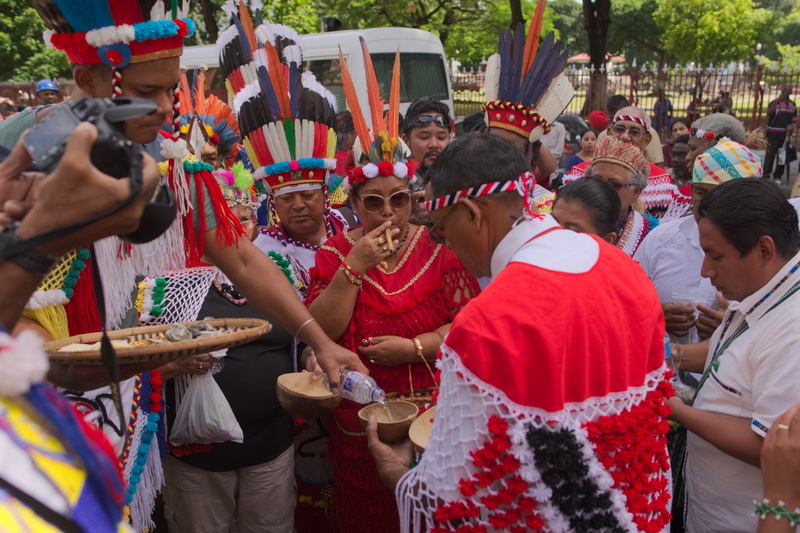 A half-gourd filled with multi-coloured flowers and other items are held overhead by Chief Ricardo Bharath Hernandez as part of a first peoples religious ceremony outside the Red House, Port of Spain. 12th October, 2017. 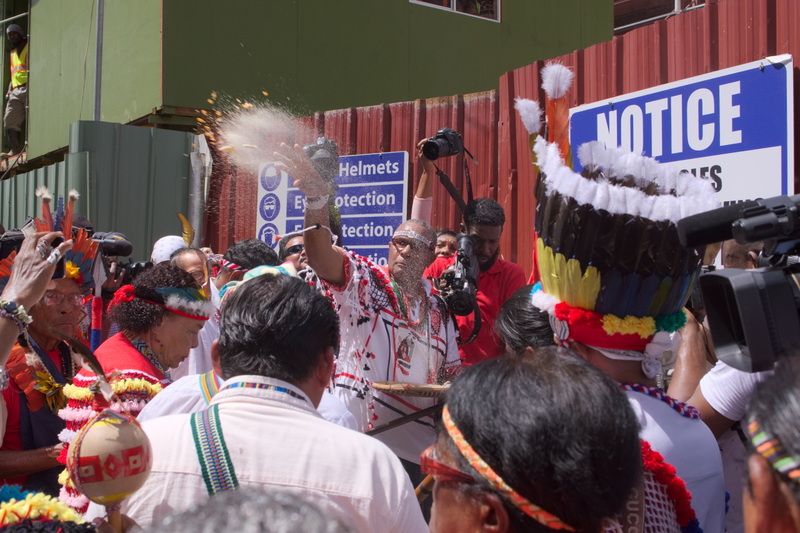 Handfuls of dust, containing corn kernels and cassava crumbs are cast in every direction during an Amerindian ritual held outside the entrance to the Red House worksite. 12th October, 2017. 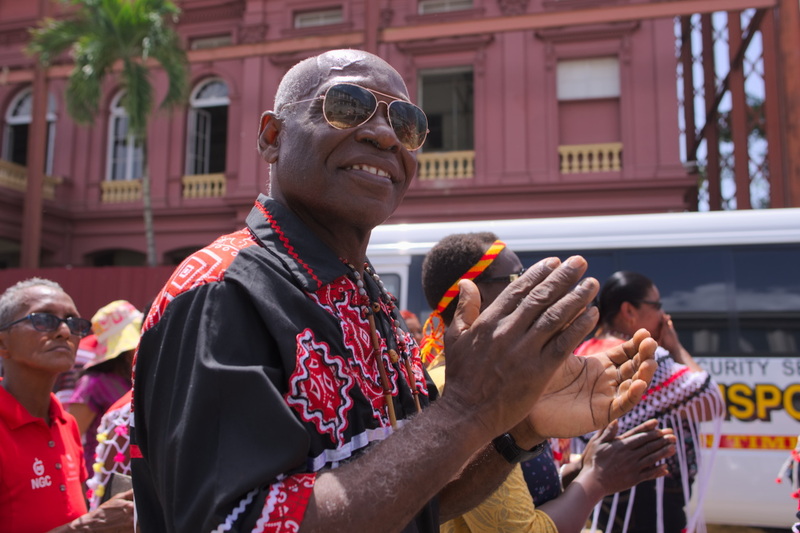 Several groups of Amerindians and first peoples in attendance of a religious ceremony outside the Red House, Port of Spain, sing and play instruments. 12th October, 2017. 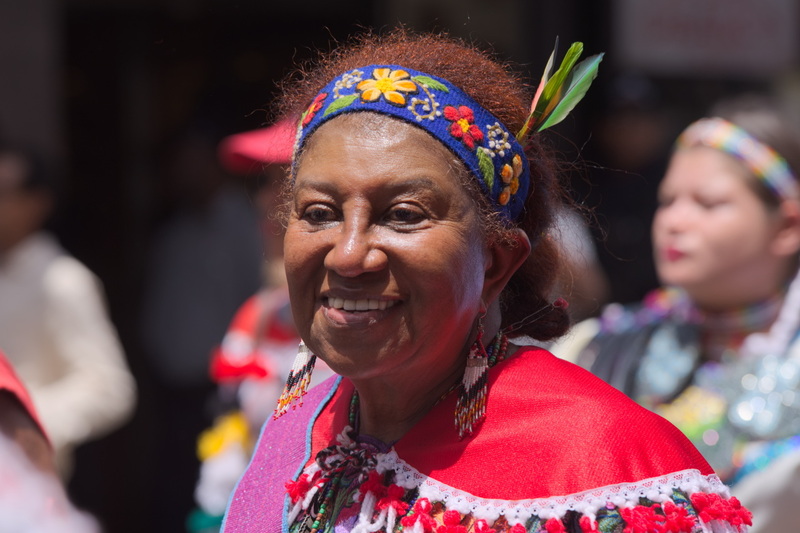 Members of the Santa Rosa First Peoples Community. 12th October, 2017. 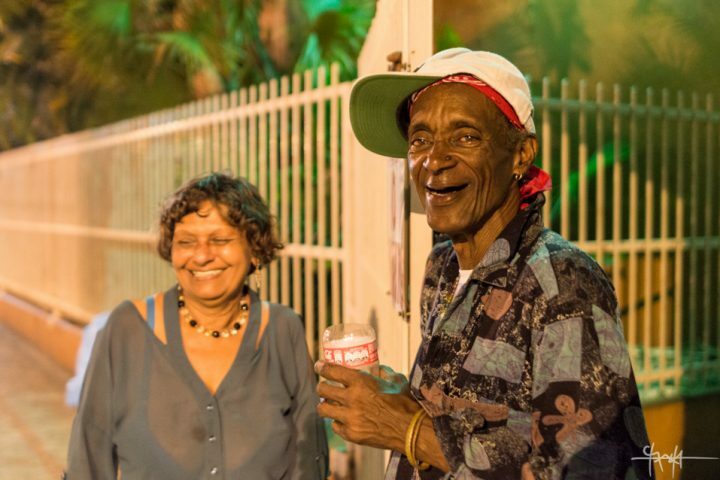 Despite what is often presently taught in Trinbagonian social studies lessons, there appears to be no groups before European intervention who had titled themselves ‘Caribs’ nor ‘Arawaks’. The term ‘Carib’ meanwhile, seems to have first begun as a rumour Columbus heard from a European-friendly subset of Lokono (or Taíno). “All the people I have met here,” he wrote, “have said that they are greatly afraid of the ‘Caniba’ or ‘Canima’.” Spanish historian, Ovideo y Valdez, seems to suggest the that word may actually have been an adjective meaning something like ‘brave’ rather than a proper noun. However, in order to win popular support for the colonisation effort, stories of ‘Cannib’ Indians may have been propagandised by the highly-religious and superstitious Spaniards, speaking of a warlike and man-eating people. They may have coined the term ‘cannibal’ to describe the practice. With this policy in place, it would have become advantageous for an ambitious Spanish coloniser to identify as many groups as possible as being ‘Carib’, thereby allowing them to be captured or slain legally. The legacy of this may be the cause of so much confusion today over the names of the groups. Many of the captured Amerindians from Kairi were enslaved on the island of Margarita. Various Amerindian communities from Trinidad and the Western Hemisphere do a smoke ritual on Abercromby Street, outside the Red House on 12th October, 2017. 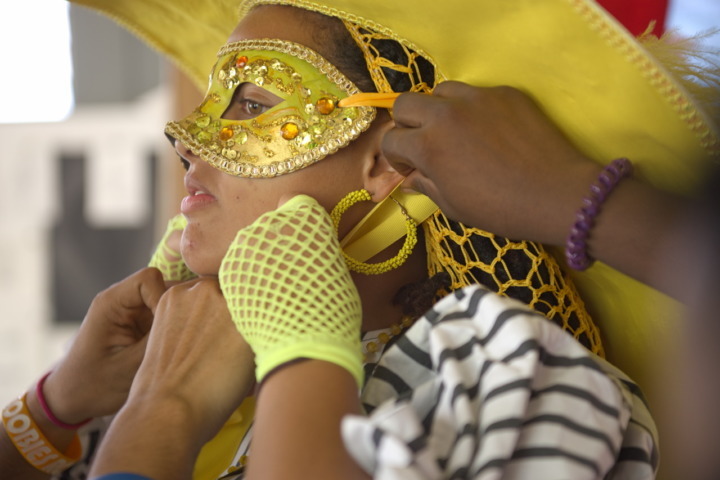 Carib Queen, Jennifer Cassar. 12th October, 2017. 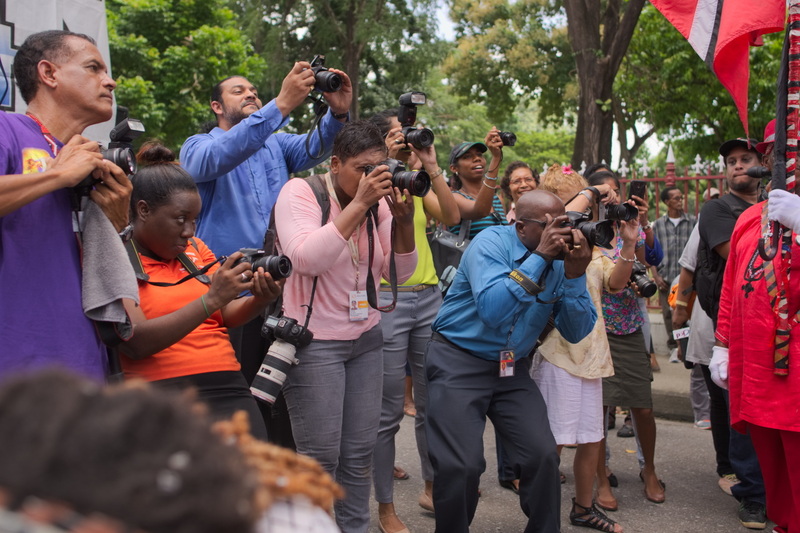 A squad of photographers stands before an Amerindian procession on Abercromby Street, Port of Spain. 12th October, 2017. 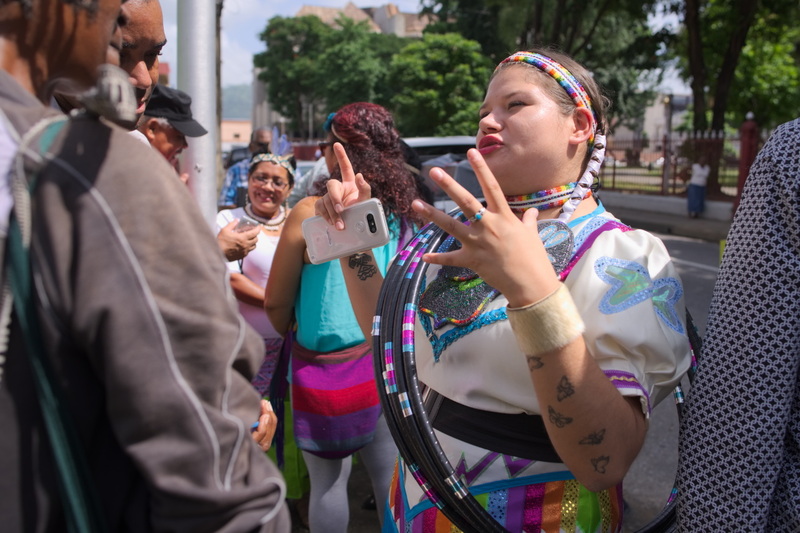 A jovial member of the Santa Rosa First Peoples Community dances through the streets of Port of Spain to the sound of Amerindian drums and singing. 12th October, 2017. 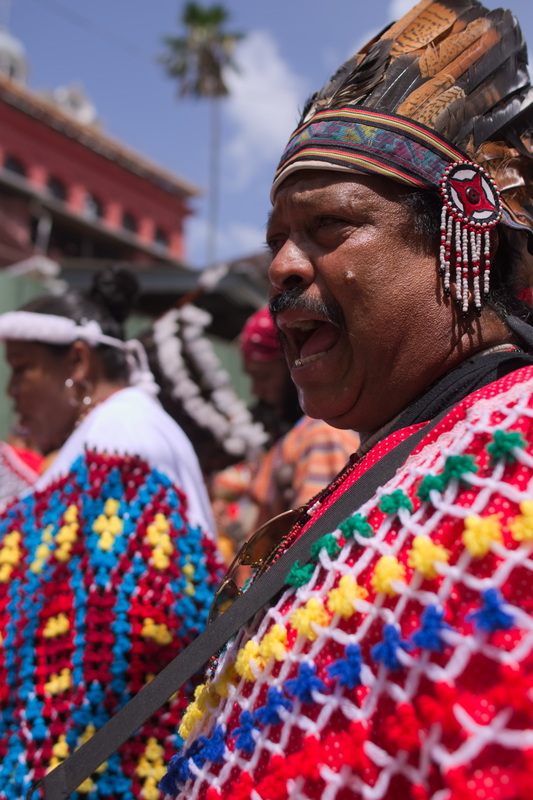 Various Amerindian peoples perform a ceremonial walk around the Red House, then through the streets of Port of Spain, as part of the First Peoples Festival Week. 12th October, 2017. 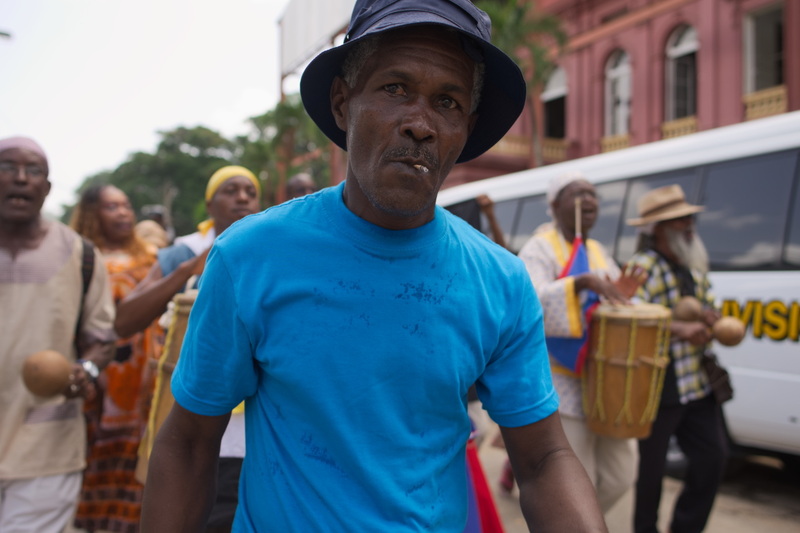 The fixed gaze of a member of the first peoples ceremonial procession through the streets of Port of Spain. 12th October, 2017. 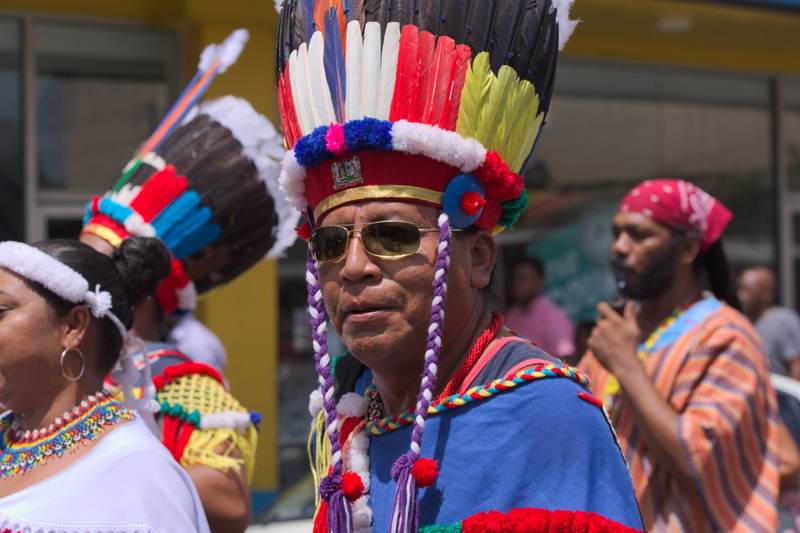 A sign questions priorities as an Amerindian procession makes its way along Saint Vincent Street, Port of Spain. 12th October, 2017. 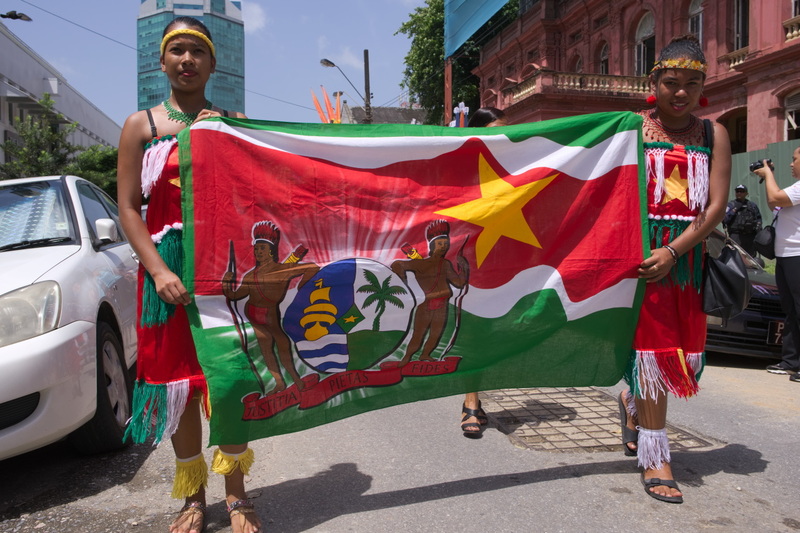 Surinamese first peoples in attendance of the First Peoples Festival Week of activity in Trinidad. 12th October, 2017. 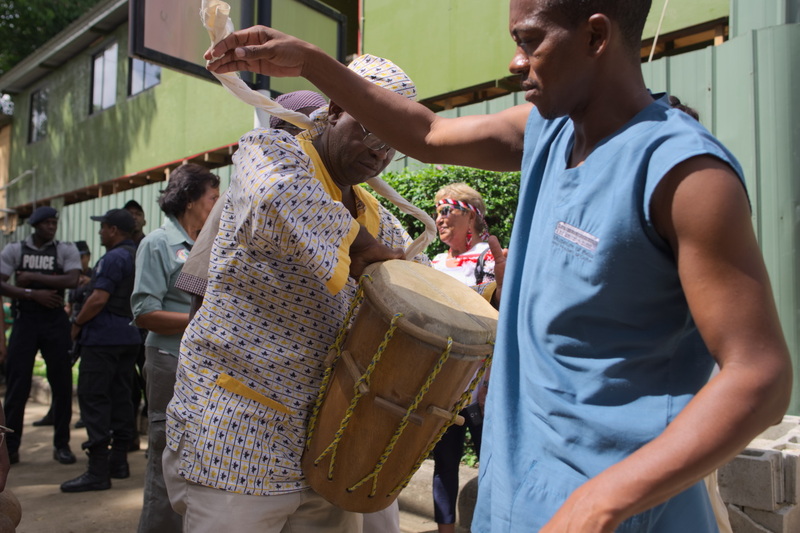 Members of the National Garifuna Council of Belize dance, chant, and sing through the streets of Port of Spain, Trinidad. 12th October, 2017. 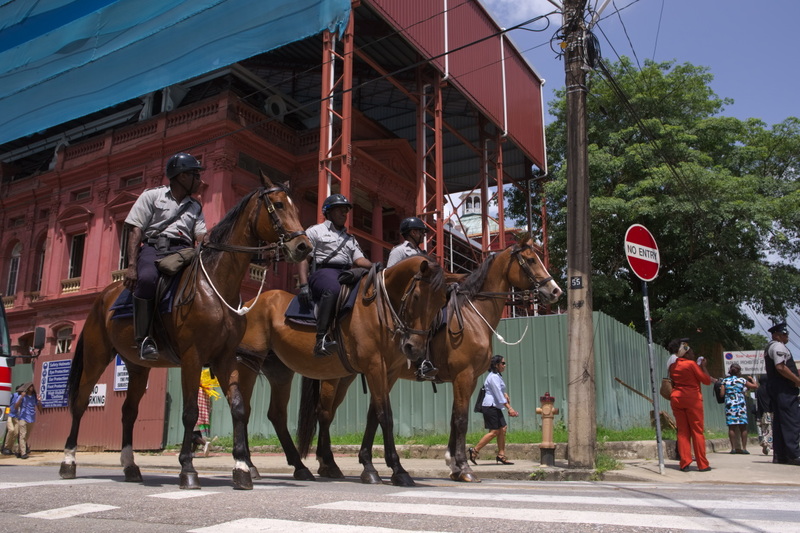 Horses and policemen escourt the first peoples as they walk through the streets of Port of Spain. 12th October, 2017. 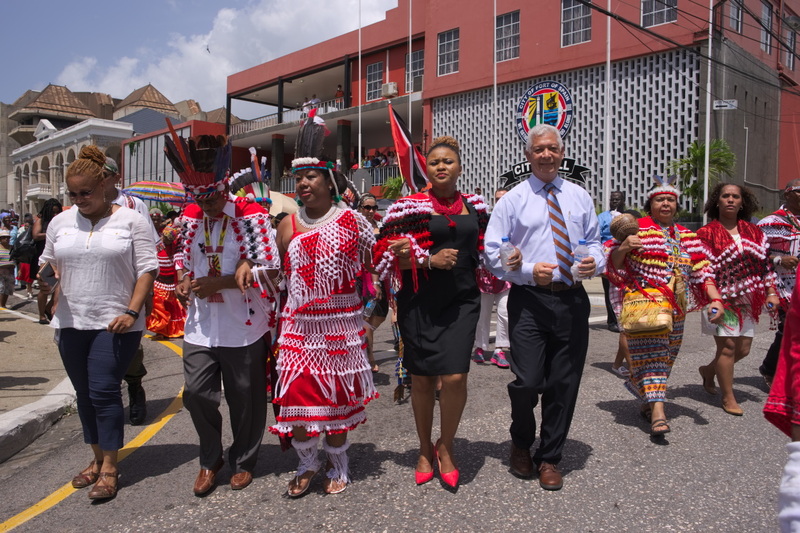 Chief Ricardo Bharath Hernandez of Santa Rosa; Port of Spain Mayor, Joel Martinez; Carib Queen, Jennifer Cassar; Arima Mayor, Lisa Morris-Julian; and others walk arm-in-arm passed City Hall, at the head of an Amerindian walk through Port of Spain. 12th October, 2017. 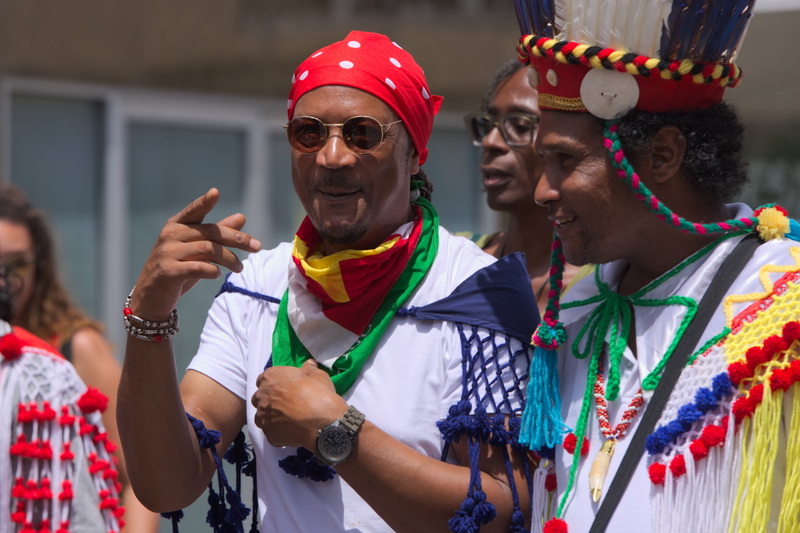 Dale Orosco walks before his Biche / Sangre Grande group as part of a ceremonial walk through Port of Spain. 12th October, 2017. 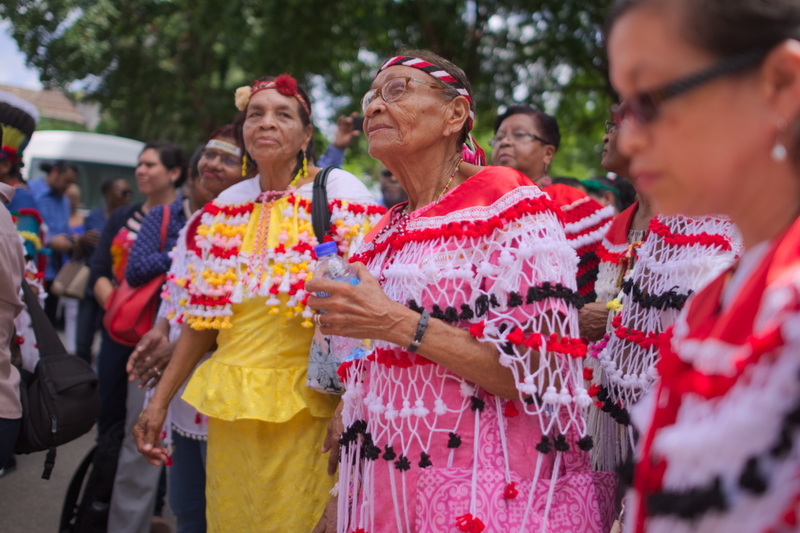 Between the years of 1687-1699, Spanish missionaries worked to convert the remaining Amerindian peoples on Kairi—now called ‘Trinidad’—to Catholicism. This activity was resented by the remaining Amerindian peoples, as described by Antonio de Herreira in 1547, “Many carib Indians were coming from the islands of Trinidad, Guadeloupe, Dominica, Santa Cruz, Matino, and other islands, causing great damage.” Among these was a Nepoyo man named ‘Hyarima’ (or ‘Hierreima’) who escaped Spanish slavery. During his self-liberation, he slew two Spaniards and devoted his Life to killing the rest. In 1636, Hyarima arrived at Tobago with the intention of driving all Europeans and their allies off the island. Later, on the 1st of December 1699, at the San Francisco de los Arenales Catholic mission of East Trinidad (site of present-day San Rafael), he might have lead the Arena Uprising, which resulted in the deaths of the Spanish governor, José de León y Echales; several hundred Amerindians; Roman Catholic priests; and all-but-one of the governor’s party. In spite of many later skirmishes, however, history would see eventually see the Spaniards come out on top, likely aided by superior technology and methods of fighting unfamiliar to Amerindian culture. A 1777 census showed 2,763 persons living on the island, including approximately 2,000 Lokono. A couple decades after, in 1783, the ‘Cedula of Population’ was begun, which would eventually cause that lingering Amerindian population to be overwhelmingly overrun by immigrants from other European countries; plantation owners from France (around the time of the French Revolution in 1789); slaves from West Africa (over the following decades); and eventually indentured workers from India (after the emancipation of African slaves in 1833). After the 1814 Treaty of Paris, Trinidad came under British rule and was legally merged with its companion island of Tobago. Bright sunlight rains down onto a man walking with his Amerindian kin through Frederick Street, Port of Spain. 12th October, 2017. 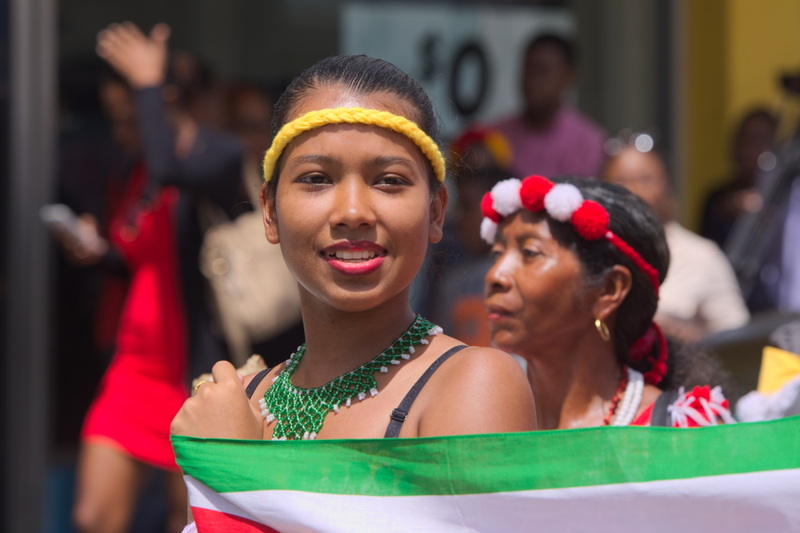 An Amerindian young woman from Suriname holds one side of her peoples' banner as part of a procession down Frederick Street, Port of Spain. 12th October, 2017. 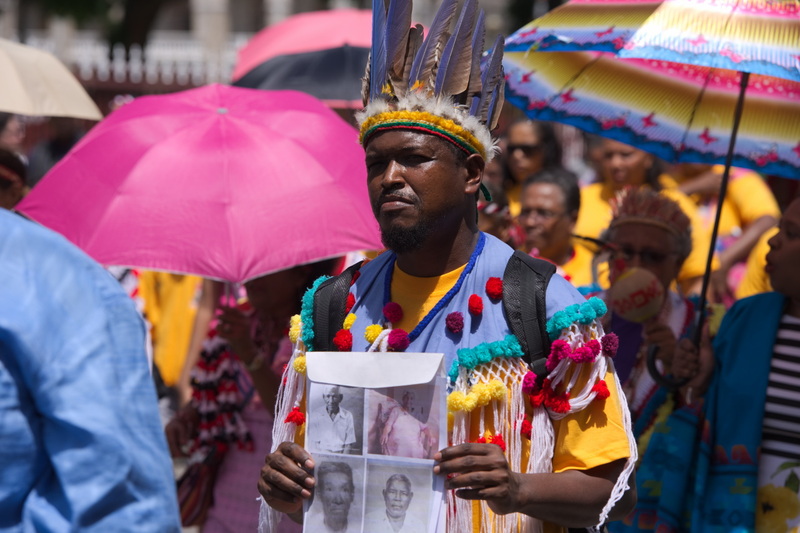 Member of a procession of first peoples walks through Port of Spain, Trinidad. 12th October, 2017. 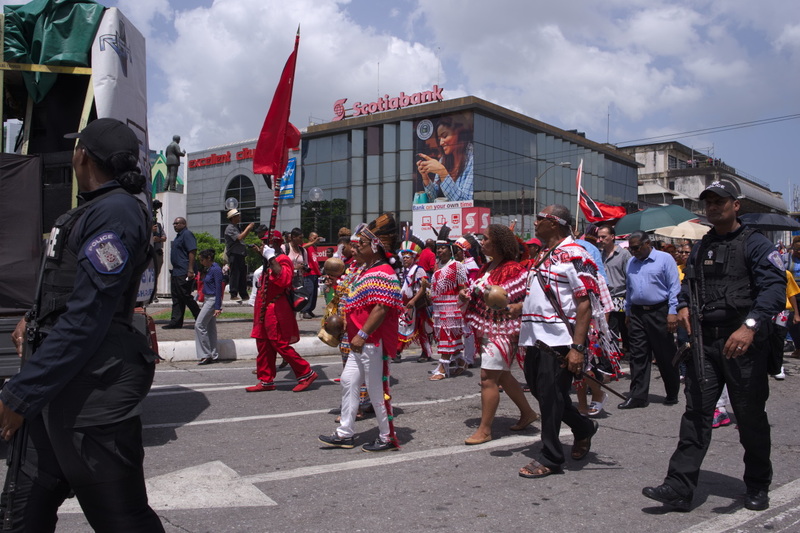 Members of a procession of first peoples in Port of Spain on 12th October, 2017. Arima Mayor, Lisa Morris-Julian, walks with the first peoples through Port of Spain on 12th October, 2017. 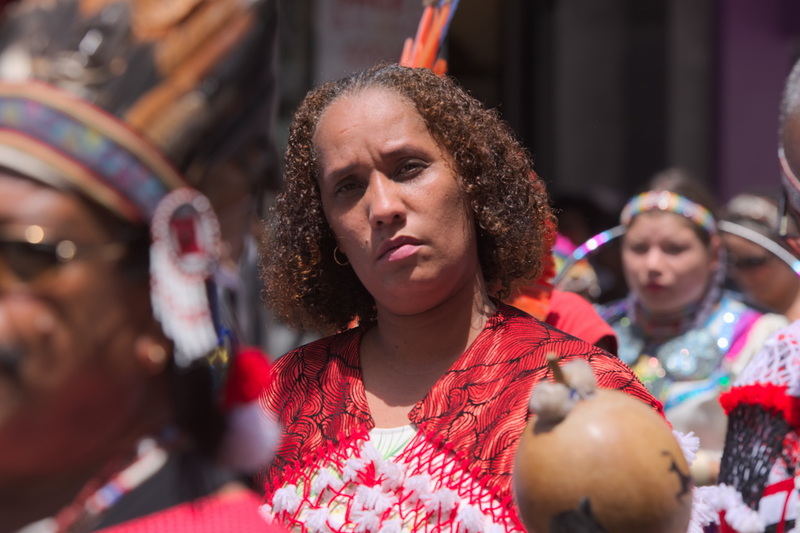 A lady in ornamental accessories walks with the first peoples on 12th October, 2017. 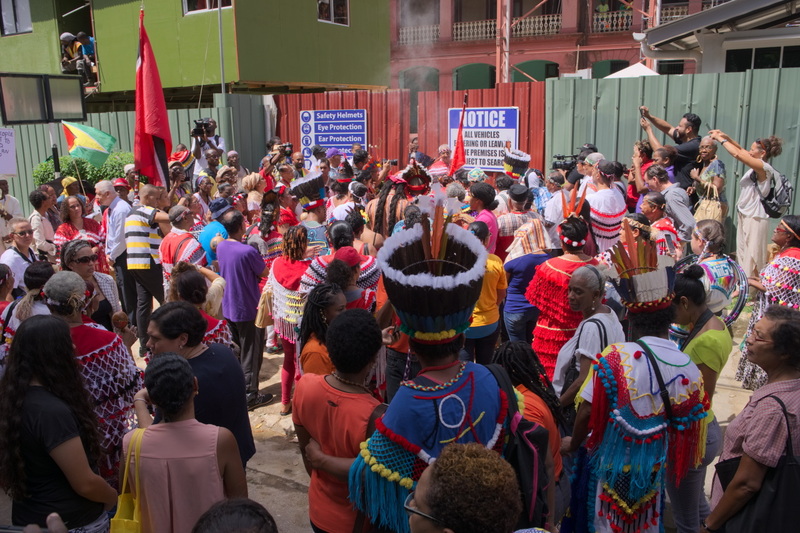 First peoples from Trinidad and across the Western Hemisphere walk through the streets of Port of Spain escourted by police. 12th October, 2017. 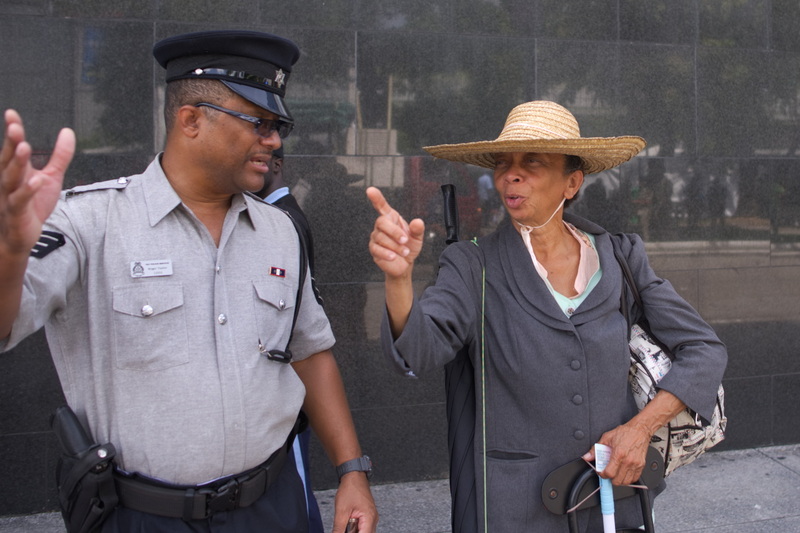 Standing opposite Independence Square, a lady discusses the First Peoples Festival Week activities with a policeman. 12th October, 2017. 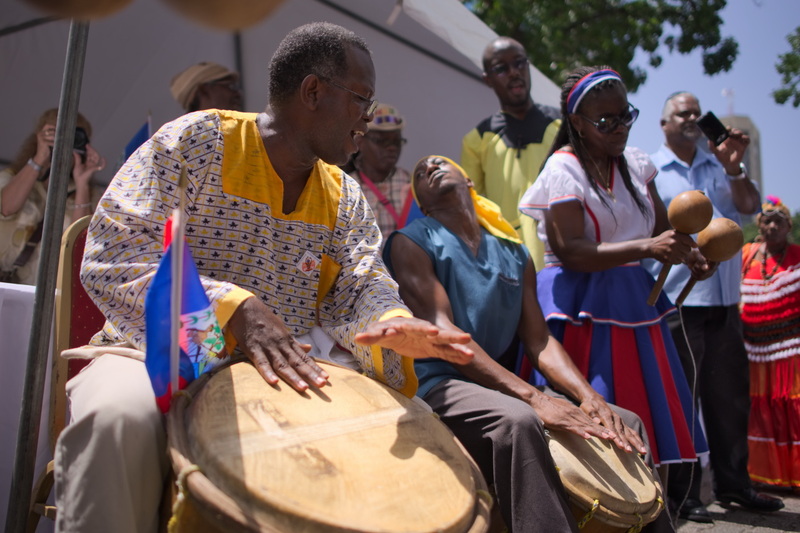 Garifuna drummers and musicians from Belize dance and sing on Independence Square, Port of Spain. 12th October, 2017. 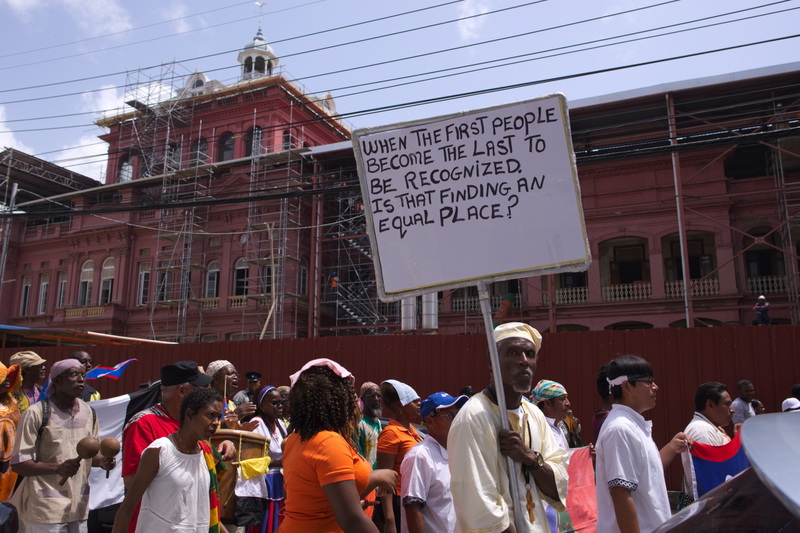 A protest sign being drawn up on Independence Square, Port of Spain. 12th October, 2017. 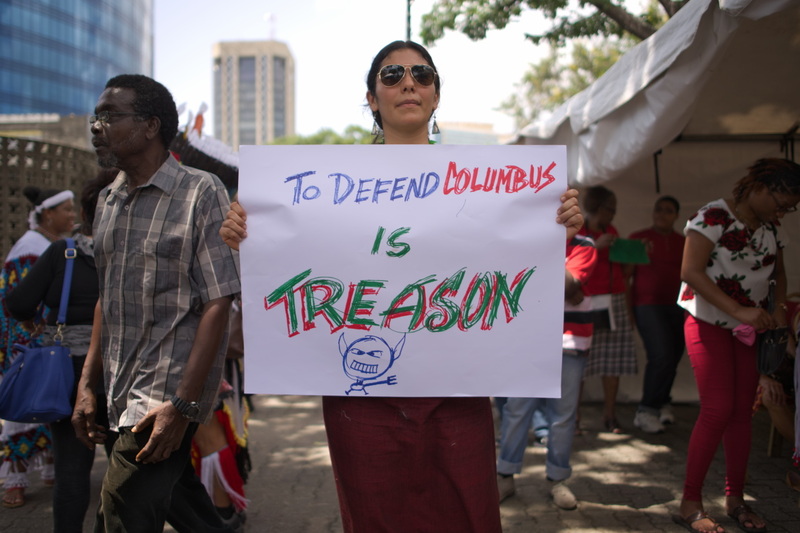 "To Defend Columbus is Treason"
Alejandra Mendez holds a sign protesting the celebration of Christopher Columbus. 12th October, 2017. 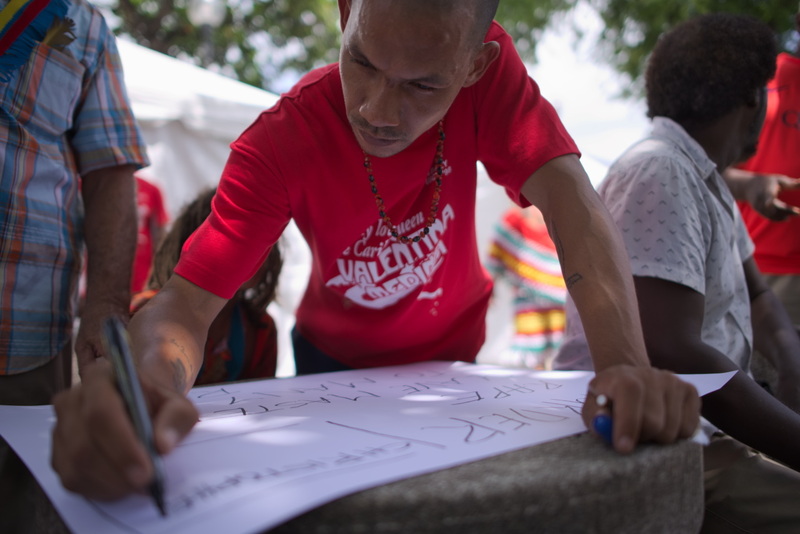 "Indigenous Peoples are Squatters in Our Own Land"
A Warao protester holds a sign on Independence Square, Port of Spain. 12th October, 2017. 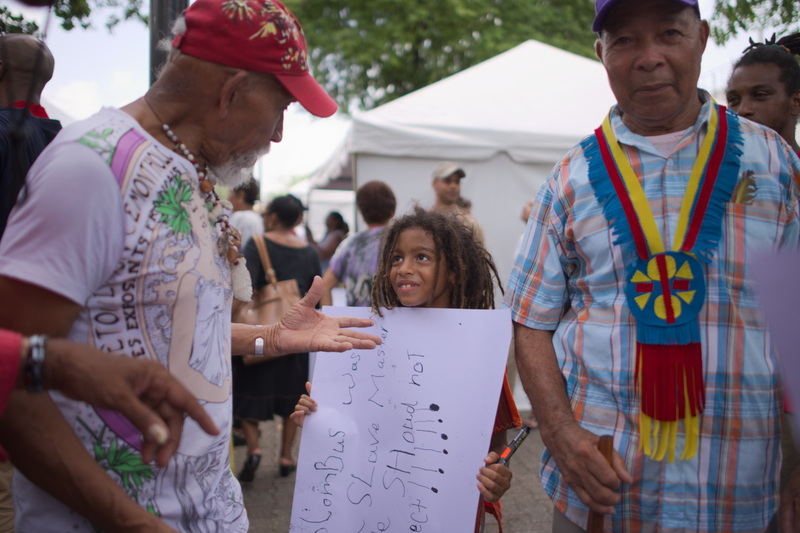 A young boy with Amerindian ancestry smiles while holding a protest sign. 12th October, 2017. 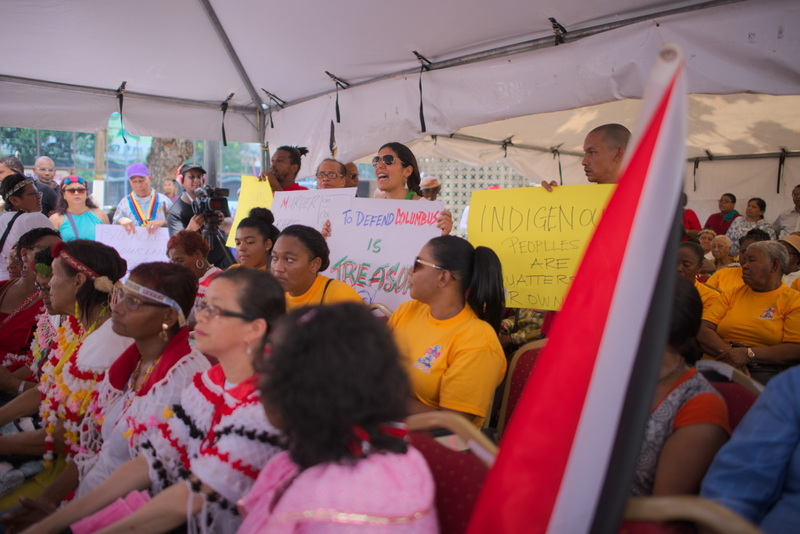 Alejandra Mendez makes her voice heard immediately after a speech by Port of Spain Mayor, Joel Martinez, at the First Peoples Festival Week. She and others from her group would like to see the removal of the statue honouring Christopher Columbus from Independence Square, Port of Spain. 12th October, 2017. In 1844, a government administration building was constructed opposite the western edge of Brunswick Square (later called ‘Woodford Square‘). After being painted a red colour in 1897, the building began being called ‘The Red House’. (In 1903 the building was destroyed during the Water Riots and was rebuilt by 1907). 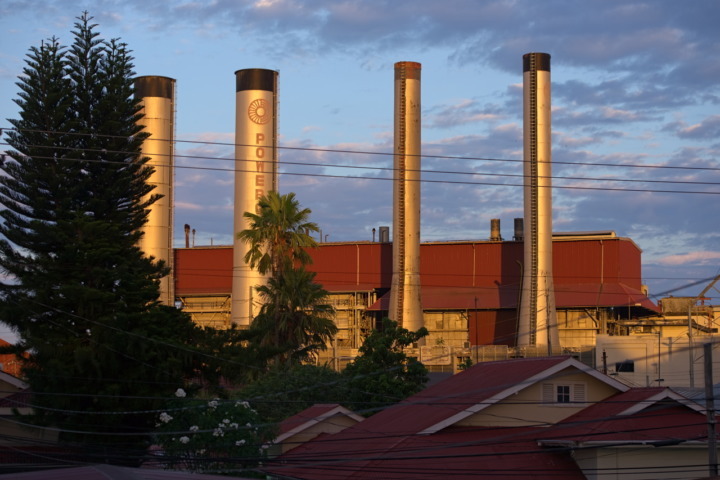 Trinidad and Tobago became independent and self-governing in 1962, then a republic in 1976. In 2011, restorative works to the Red House were begun, and were scheduled for completion in 2014—three years prior to this writing. While digging three-metre deep preparatory pits on 1st April, 2013, the Urban Development Corporation of Trinidad and Tobago (UDeCOTT) uncovered what appeared to be bone fragments. Work on the Red House restoration seemed to have halted then, eventually continuing in 2017. As of October 2017, the possibly-Amerindian bones remain locked in glass cases at the TT Parliament’s current, temporary location on the Hyatt waterfront. This is seen as a concern by many modern-day, surviving ‘First Peoples’, who believe that the displacement of the bones may be discomforting the Ancestors, and therefore perhaps drawing their anger. The Santa Rosa First Peoples Community would like to see the remains turned over to themselves so they could be appropriately honoured and re-buried. 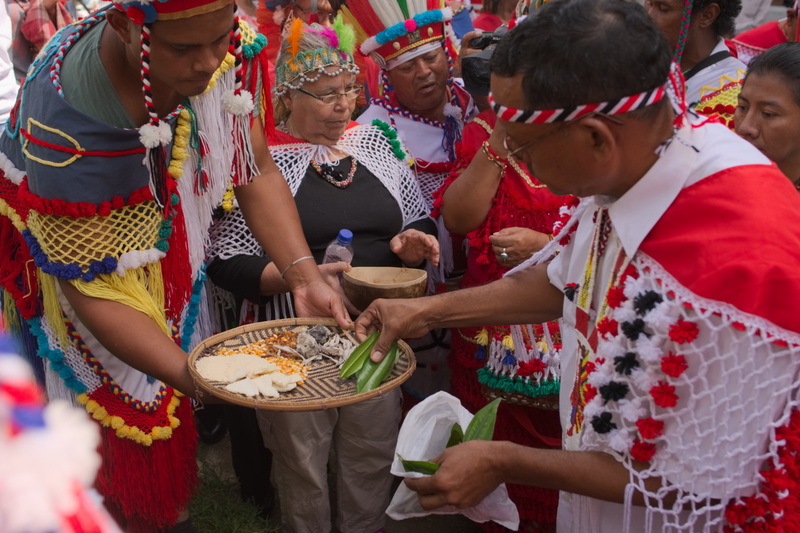 During the First Peoples Heritage Week of activities in October 2017, First Peoples from Santa Rosa, Trinidad; South Trinidad; Belize; Canada; Ecuador; Guyana; Suriname; Saint Vincent; Venezuela; and others (however Dominica was absent, as their island was severely damaged by Hurricane Maria a few weeks prior), visited the Red House to conduct a smoke ritual for the Ancestors. 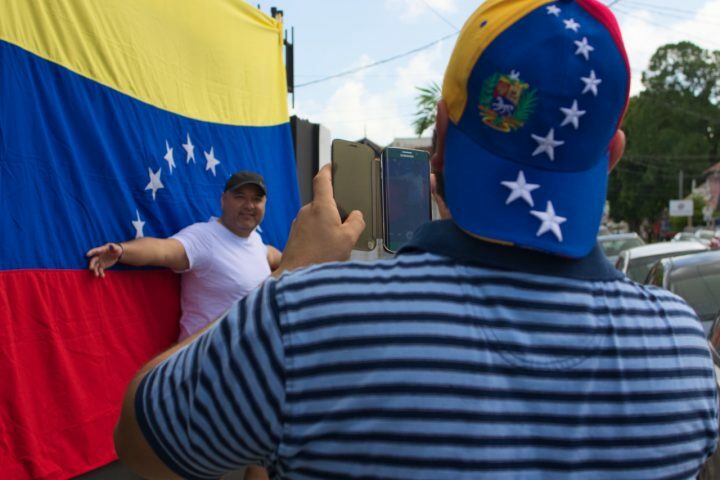 Escourted by police, the group became a procession which walked to Independence Square, South Port of Spain, where speeches and displays took place. 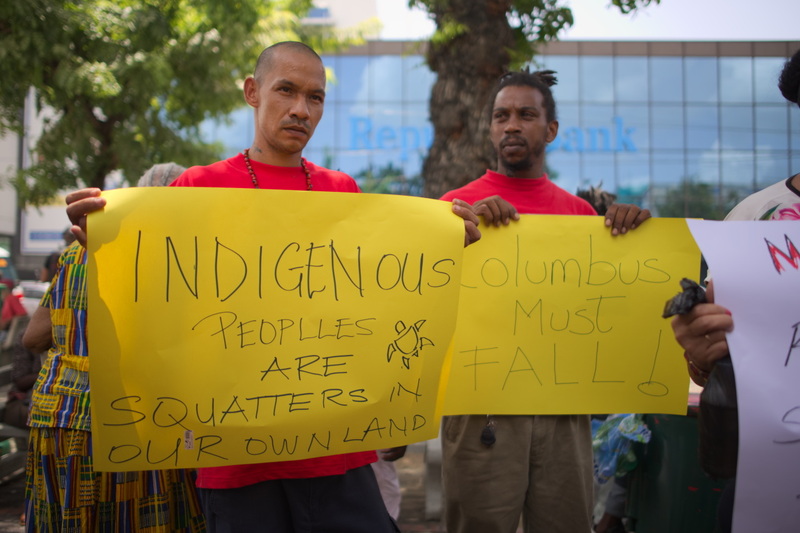 A small sub-group of First Peoples present at the event in Port of Spain, possibly Warao, drew up placards calling for the removal of the statue of Christopher Columbus from the Independence Square. It is believed that Columbus, who himself was murderous and genocidal, ought to not be celebrated. Suggestions were made that the statue be moved to a museum, so as preserve the history while removing his recognition.